Zakerin, S., Rezghi, M., Hamzeloo-Moghadam*, M., Hajimehdipoor, H. (2017). Formulation and quality control of a poly herbal tranquilizer syrup. 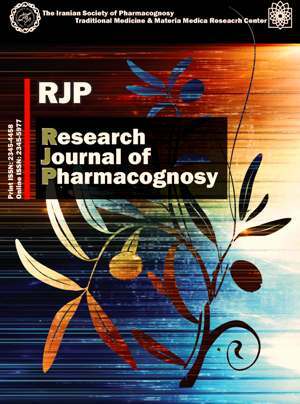 Research Journal of Pharmacognosy, 4(Supplement), 100-100. S. Zakerin; M. Rezghi; M. Hamzeloo-Moghadam*; H. Hajimehdipoor. "Formulation and quality control of a poly herbal tranquilizer syrup". Research Journal of Pharmacognosy, 4, Supplement, 2017, 100-100. Zakerin, S., Rezghi, M., Hamzeloo-Moghadam*, M., Hajimehdipoor, H. (2017). 'Formulation and quality control of a poly herbal tranquilizer syrup', Research Journal of Pharmacognosy, 4(Supplement), pp. 100-100. Zakerin, S., Rezghi, M., Hamzeloo-Moghadam*, M., Hajimehdipoor, H. Formulation and quality control of a poly herbal tranquilizer syrup. Research Journal of Pharmacognosy, 2017; 4(Supplement): 100-100. Traditional Medicine and Materia Medica Research Center and Department of Traditional Pharmacy, School of Traditional Medicine, Shahid Beheshti University of Medical Sciences, Tehran, Iran. Background and objectives: Herbal drugs are rapidly becoming popular in recent years as alternative therapies. Numerous poly herbal formulations, which are combinations of different herbal materials/extracts are being used for prevention or treatment of various disorders. The present research has been undertaken to formulate and evaluate the quality of a tranquilizing syrup based on Iranian traditional medicine references. Methods: A decoction containing Echium amoenum L., Lavandula spp. L., Melissa officinalis L., Cuscuta chinensis Lam, Vitis venifera L.,Prunus domestica and Alhagi camelorum Fisch.was prepared and then filtered. The filtrate was concentrated and different sweeteners and flavoring agents including, brown sugar, honey, masking flavor, sucralose, lemon and orange essential oil were examined to cover the unpleasant taste of the product caused by Cuscuta chinensis. Finally,sucralose was found to be beneficent to cover the unpleasant taste. The final product was evaluated physicochemically and microbiologically according to standard protocols. Results: The results of the quality control assessments demonstrated that the color, odor, microbial and physicochemical characteristics of the syrup were acceptable. Conclusion: The formulated syrup can be examined in in vivo and clinical studies as a tranquilizer with respect to its tranquilizing herbal content.